Wildly popular in ethnic and American kitchens, basil's warm, sweet, mildly minty/peppery flavor is enjoyed with vegetables (especially tomatoes), in dressings and sauces, soups and stews, and with meats, beans, and grains. It's even earned a place next to oregano on pizzas. Sweet basil is the name for the common cooking basil, though there are several kinds of basil, sweet basil is the most common in culinary use. 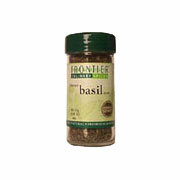 Domestic Sweet Basil Leaf Cut & Sifted is shipped in a discrete, unmarked package. Orders are processed immediately and usually take about 3 to 5 working days to be received. We do ask that you try it for 2 to 3 weeks to feel the full effects. Any information received is used only for order processing and shipping purposes. Your information, such as e-mail address, will never be disclosed to a third party.